THE shipping industry has encountered rough seas over the past decade. Between 1985 and 2007 trade volumes shot up at around twice the rate of global GDP but since 2012 their rate of growth has barely kept pace, leaving the industry with overcapacity. Freight rates for containers have plunged by a third since 2008. Worse may be to come. The industry does not regard as good news President Donald Trump’s announcement on June 15th of tariffs of 25% on up to $50bn of Chinese goods, which will slow trade growth further. Now a veritable hurricane of new environmental laws is about to hit. Shipping accounts for only around 2% of global carbon emissions, but is quite dirty. 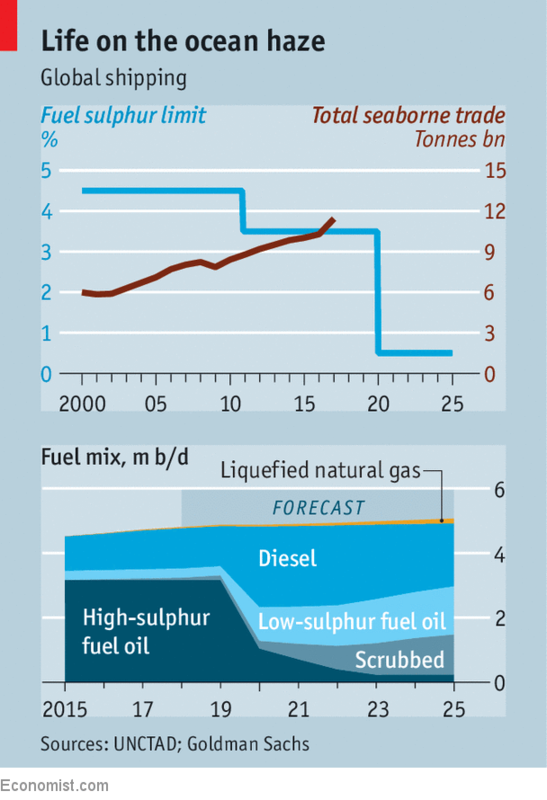 Burning heavy fuel oil, the industry produces 13% of the world’s sulphur emissions and 15% of its nitrogen oxides. And by 2050 ships will be producing 17% of all carbon emissions if left unregulated, according to research by the European Union.